In one horrific night, Chance Rain’s world is turned upside down. Chance and his older brother Patrick are jolted from late night work on their uncle’s ranch by screaming. They journey through their small town, Creek Cause, to find infested adults attacking them at every turn. They wander through the town facing nightmares come to life at every turn. Fighting for their lives, the Rain brothers gather any children not yet taken by the changed adults and find shelter at the local high school. There they find the rest of the kids of the town terrified, but temporarily safe. The kids of Creek Cause organize themselves in a place overrun by transformed adults, when a sudden turning changes everything. "Gregg Hurwitz tells the story of THE RAINS in gruesome detail, intertwining zombie terror with alienated sci-fi in a tale like no other." With one week until Patrick’s eighteenth birthday, Chance, Patrick and Alex, Patrick’s girlfriend, struggle to find a way to save Patrick and the rest of the kids before it’s too late. The changed seem to be on a mission and it is their job to stop it. Everyone has to grow up before their time, but if anyone can do it, The Rains will find a way end something that may turn out to bigger than anything kids from a small town could ever dream of. 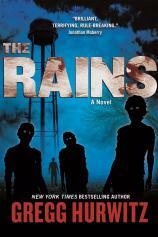 Gregg Hurwitz tells the story of THE RAINS in gruesome detail, intertwining zombie terror with alienated sci-fi in a tale like no other. Ceaseless action sets the pages turning on a novel I was unable to put down. Hurwitz exhibits his thriller expertise in a fast-paced way that I imagine is exactly how this scenario would play out. At times, I felt as if there was too much information packed in the pages, as the plot expanded and thickened at rates I almost couldn’t keep up with. This was well-balanced by strategically placed descriptions that maintained the vision that was playing in my mind. I occasionally had to slow down and read a page again, partially because so much happened, but additionally because I couldn’t the plot twists at every turn. Chance shows readers a realistic look to the typical heroic protagonist, realizing the fear we would all feel if our world was rattled in such a way that his was. His fear is not overwhelming and his intelligent bravery builds a character I can’t help but to attach to. He used to be a boy who got lost in the world of stories, but grows in every page to become someone that no longer looks up to his brother, but has other kids looking up to him. At the beginning of the novel, Chance saw Patrick in the way all younger brothers envision their older siblings. But as circumstances evolve they risk their lives for each other until there is almost nothing they haven’t done for the other. Patrick is all Chance has, and it’s refreshing to see a well-developed relationship that isn’t romantic in the slightest. Their trials are told in heartbreaking clarity as Chance faces the facts that he isn’t the only one Patrick has to look out for. In a world where children are the last hope, bravery and heart can only go so far. Fans of ENCLAVE and THE FIFTH WAVE will love this hybrid that breeds a world where only one thing is certain. Rain must come down.